INVESTMENT OPPORTUNITY. BACKS TO PASTURE. MOUNTAIN VIEWS! Open, unique, very functional floor plan with 3,900+ SqFt, 3 bedrooms upstairs PLUS main-level study and 3 baths. Spacious living areas. Vaulted ceilings. Abundant natural light. Lovely park-like setting. 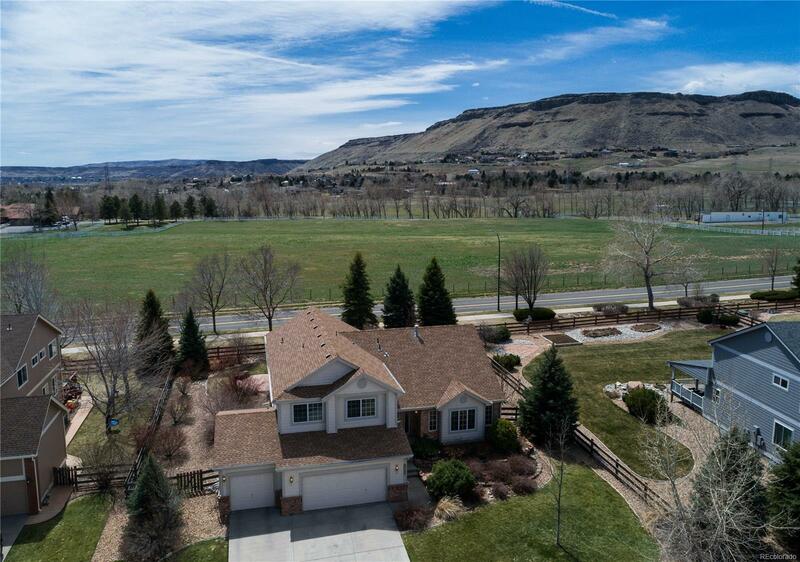 Serene, sunny, south-facing backyard with flagstone patio and wonderful views of pastures and North Table Mountain. No neighbors behind! The kitchen includes an island, granite tile counters, gas range and double oven. It easily flows into the family room with gas fireplace. Built-in speakers. Some hardwood floors. Views from most windows! Upstairs, a Master Suite and 2 additional bedrooms. Open basement. Extra-large lot! Sprinkler system. 3-Car garage. Located in elegant Sunrise Ridge. Just 1 block from park and trails. Enjoy nature at North Table Mountain Park, Long Lake Regional Park and Arvada Reservoir. Minutes to shops and restaurants. Rapid access to Hwy 70. BANKRUPTCY ESTATE. EXCELLENT VALUE. SOLD AS-IS.